Singing bowls go back to about 1000 BC and have been used ever since. It is said that each bowl is hand hammered alloy of bronze and seven metals: gold (representing sun), silver (representing moon), mercury (representing Mercury), copper (representing Venus), iron (representing Mars), tin (representing Jupiter), and antimony (representing Saturn), some say there are nine metals (additional zinc and nickel), and some are saying there are ten metals the last one is from heaven - meteorite... Honestly, no one knows for sure, since the answers are vague..... - we know they are original, they have beautiful sound, they are hand hammered. 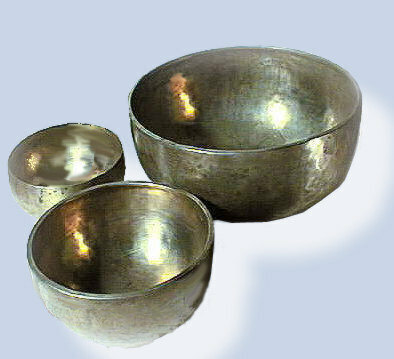 Singing bowls are sound meditation devices used in Tibetan Buddhist monasteries. The bowl can be made to sing with a complex harmonic tone that draws the mind into a state of meditative mental focus. Each singing bowl can vibrate up to seven individual and simultaneous tones, each at its own consistent frequency, and can sustain such a rich vibration for minutes. The sound resonating from singing bowls is pure and very powerful in centering the mind and body. It has been found that among the wave patterns of different singing bowls there is a measurable wave pattern that is equivalent to the alpha waves and/or theta waves produced by the brain. They have been used for spiritual awakening, for healing, for meditation... It is said: their sound can make an opening to other realms,... it can take a message to Spirit, to Angels,... it carries ones prayers... it balances left-right brain synchronization.. these subtle sounds connect you with the universal sound...etc. Some accounts actually state that it is forbidden, even within the monasteries, to talk about the singing bowls and that the highest lamas used them in secret rituals to travel to other dimensions and other realms. It is stated further that the secrets of sound yield so much power that they must be kept hidden. There are two basic ways of playing a singing bowl: you can either strike it with a "puja" - stick (made of wood) for percussive, pulsating tones; or you can rub around the edge with a "puja" for a sustained effect (in a way similar to that of rubbing a finger around the edge of a wine glass). The pressure that you use to apply "puja" onto the rim of the bowl will affect the sounds the bowl produces, as also will the speed with which you rotate it. Too much or too little pressure, or the wrong speed, will cause a nasty ‘rattling’ sound. Resting the bowl upon the palm of your hand will usually enable you to appreciate the experience to a greater depth than placing the bowl on a tabletop or pad. You can make the bowl "sing" by continuously rubbing "puja" around the outside rim of the bowl. When rubbed in this manner, the bowl resonates with pure tones. The sound is beautiful, haunting, mesmerizing, it seams to be coming from some other dimension, from outside, it grabs your mind and attention. It is difficult to describe it. One must hear it. You may hear the bowl singing, hours or days later after you played. This is natural and signals an enhanced state of awareness. It is an excellent tool for deep relaxation. Singing Bowls are storming the West with their mesmerizing sounds.